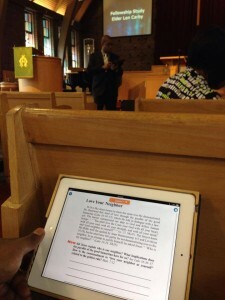 Adult Bible Studies are held at 10:30am, before the corporate Worship Service. This time is used for a lesson study from scripture, fellowship with other individuals in the church, and provides a “safe place” to express views and ask your most pressing questions about the Bible. At Kanisa, our Adult Bible Studies are very interactive and engaging, as well as open to a range of varying maturity levels of faith. We also like to incorporate technology during these studies to assist in a multi-sensory learning experience. PowerPoint presentations are often used and free Wi-Fi is available for those who use digital Bibles and want to reference the Internet. Our hope with Adult Bible Studies is to create an environment that best helps you explore the truths of the Bible on a level that is easily understandable for you. We don’t use fancy language that visitors or new believers may not understand. The class is 50 minutes long. It is one of the best ways for you to learn about God and develop new friendships.